This reproducible four-session study invites discussion and imagination around four foundational claims of the church and the scripture passages that inspire them. Written by Rev. Marcus Kunz and Rev. Susan M. Lang, the study gives helpful instruction and creatively relies upon Book of Faith lenses—devotional, theological, historical and literary—to invite conversation. Participant and leader guides are available. The Life of Faith Initiative is a new grassroots effort within the Evangelical Lutheran Church in America (ELCA) that seeks to connect the Book of Faith initiative to the many and varied forms of service to neighbors through family, workplace, school, local community, and world. Each expression of the church, beginning with the primary expression lived out by all the baptized, is encouraged to develop approaches and resources in order to make the Life of Faith initiative a vital part of its reason for existence. The Hein-Fry Book of Faith Challenge if a project jointly sponsored by the seminaries of the ELCA, the Hein-Fry Planning Team, and the Book of Faith initiative. It launched in 2015. A collection of resources created for the 2015 ELCA Youth Gathering, including two PowerPoint presentations and two supporting documents. The story-by-story art panels, historical factoids, thoughtful questions, and literary insights (help sheets) offer guidance for a unique journey through the story line of Mark's Gospel. 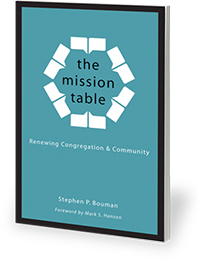 The June 2014 issue of Currents in Theology and Mission is dedicated to the Book of Faith Initiative. The editors of Currents are kindly making the issue available for downloading at no cost.